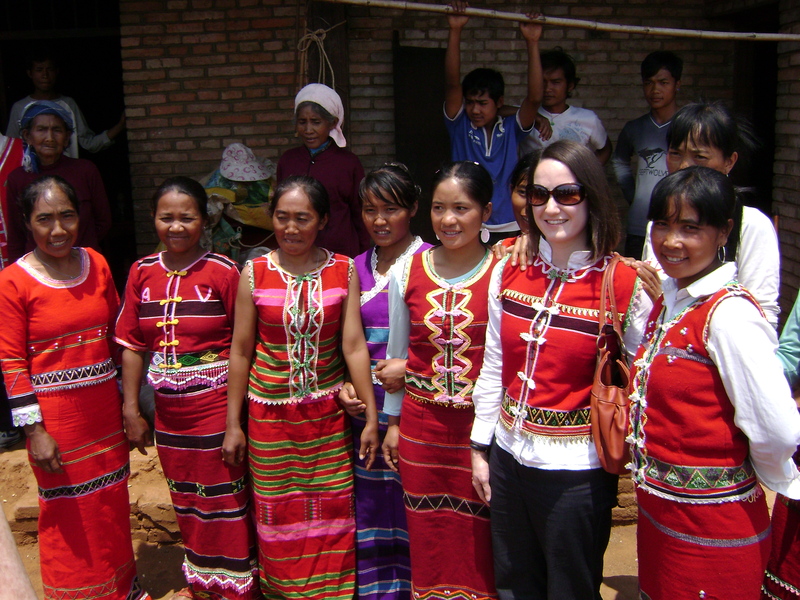 The author with a group of Wa minority women on a recent trip to Yunnan. It recently dawned on me that to an outsider this blog may appear a rather incomprehensible smattering of international living, cultural provocation, and spirituality. To me, however, this blog reflects my dual callings to ordained ministry and to a scholarly career in cultural anthropology, and my conviction and willingness to consider the two simultaneously. While anthropology and Christianity (particularly missiology) have often found themselves at odds, I find that cross-cultural encounters challenge me and enlighten my fullest understanding of God, while it is my faith that anchors not only my eternally-curious and gracious outlook on my life, but also my conviction that we are all made in the image of God, and that the God I worship revels in diversity. In sum, I refuse to leave my anthropology at the door as a pastor, and my faith behind as anthropologist, and so I’ve created a blog where I can do both and call it sacred. I hope you will enjoy reading my attempt to juggle ministry and anthropology, and my ultimate journey to love and understand people around the world just a little bit better. This blog represents my own personal viewpoints, and does not reflect the official stances of any of the institutions, academic or religious, with which I am affiliated. I aim to cover a wide range of topics, including but not limited to my areas of personal and scholarly interest in Chinese culture, life in Guangxi, where I recently completed two years of dissertation fieldwork, foster care, adoption, and family life (my research areas), as well as yoga, running, prayer, ministry, good wine, food, beer, travel, and books. Please do not hesitate to contact me for further information, and please comment frequently. And thanks for visiting my little sacred space. Erin, just found your blog (I’m Vic’s mom of Vic & Beth)….I was reading a response you left on Seeing Red In China……it’s a small world. Shall spend some time reading your blog…..you have some wonderful photos there. Hi Kate. So fun to make this connection. Evan and I always hear great stories about the time you and Don spent in China via Beth and Vic. I can’t take credit for the photos on my blog, however, as that’s all my husband’s handiwork. Please do be in touch, and it’s so fun to hear from you. Hi, Just found your blog by Goggling ‘faith and anthropology’. Great to see this and look forward to reading it all. I am also a graduate student in cultural anthropology and also a believer. I think we may be very much alike!! Cheers and good luck with your writing up!! I love the idea of blending faith and anthropology. To me they go hand-in-hand! I’ve been doing my own mixing of faith and writing, faith and everythingelse. That’s my favorite thing about blogging – it’s a place you can explore all the facets God created you with. I’m excited to keep reading your thoughts! Jaye, glad to connect with you, and I’d love to hear more about how you combine psychology and ministry! I applaud your willingness and desire to blend your love of cultural anthropology and your love of God! My father, David Fortier, was one of last the anthropologist who still considered his field to be among the humanities. I am a scientist by training and inclination. Both of us, also artists. Goethe said something like, “If you have art and science, you have the foundation of religion.” For me, God speaks all these languages of the soul. To be multilingual in our communication with both God and people is very expansive! You might want to check out the central theme of my blog, Landscaping the Sacred; Discovering the Sacred in the Natural World. Here I also do the blending dance; I blend trained scientific observation and cultivated artistic sensitivity with my own search for God. I will be following your journey with the interest of a fellow seeker. Thanks for your comments! So inspiring to hear the blended backgrounds of others and the way God is the great synthesizer in this blending dance of life! I have spent much of my life trying to balance (and separate) work and life – I am glad to see you blend the two in such a meaningful and uplifting way. Thank you for sharing your perspective and letting me see that I do not have to have a “split personality;” my work and my life can intersect in meaningful ways without compromising either. Amen! Couldn’t have said it better myself. Thanks for the affirmation and thanks for reading.